BRAND NEW 2K MASTER! Ruth Bennett (Barbara Stanwyck, Witness to Murder, The Lady Eve) has inherited an old house in Gettysburg, Pennsylvania Amish country. 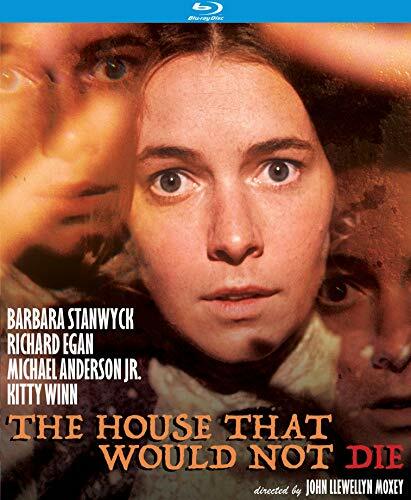 She moves into the house with her niece, Sara Dunning (Kitty Winn, The Panic in Needle Park, The Exorcist). The house was built before the Revolutionary War and is said to be haunted by the spirits of its original inhabitants. With the help of Pat McDougal (Richard Egan, The 300 Spartans, GOG), a local professor, and one of his students, Stan Whitman (Michael Anderson Jr., The Sons of Katie Elder, Major Dundee), they delve into the history of the house and find a scandal that involves a Revolutionary War general, who was suspected of being a traitor, and his daughter, who had disappeared after eloping with her boyfriend, a young British soldier. The spirits of the general and his daughter take possession of Pat's and Sara's bodies and a dark secret is revealed. Directed by legendary TV-movie director John Llewellyn Moxey (The Night Stalker, Home for the Holidays) and with a teleplay by the great Henry Farrell (What Ever Happened to Baby Jane, Hush… Hush, Sweet Charlotte).